It's almost time for the DVD & BluRay release of Monsters University and I cannot wait! Due to a crazy summer we didn't get to see it in theaters and I am very anxious to see it. My favorite way to celebrate a movie release - a Party Board of course!! 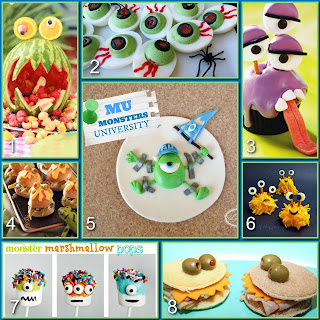 I have already shared my Monsters University Food Party Board. Here's a reminder. 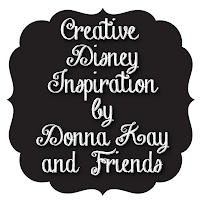 So today we will do a Monsters University Decor Party Board. Monster Photo Booth - Photo booths are pretty popular right now, so I had to include these monstrously cute photo booth props from Little Retreats on Etsy. A quick tip - if you're having your party outdoors be sure to put the photo booth in a shaded area so your guests are squinting and your pictures are not blown out. 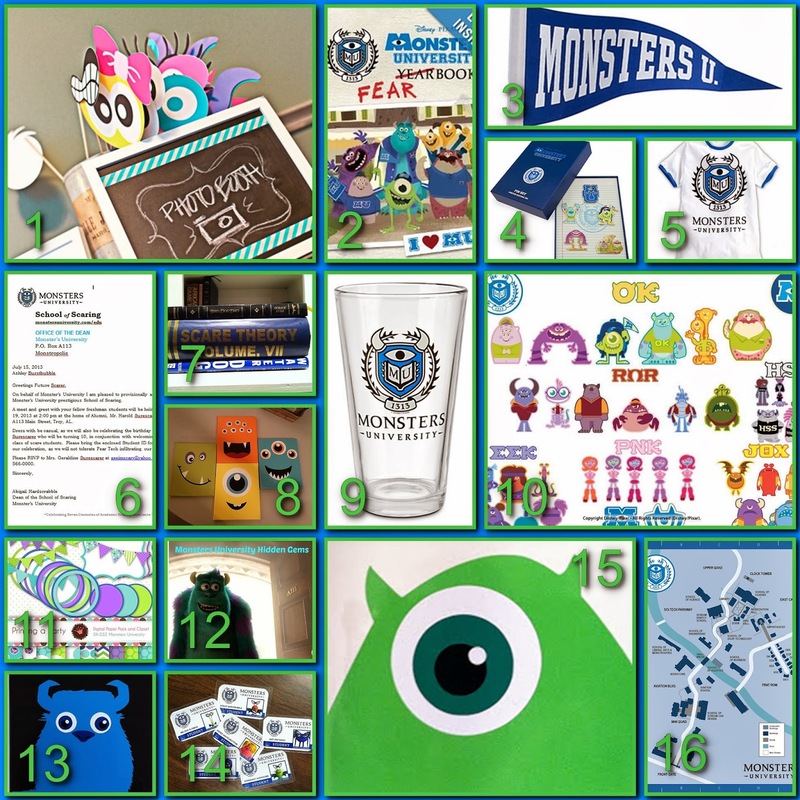 Monster's University Fear Book - After you make everyone a Student ID (#14) put together a mock MU Year Fear Book. Channel your inner high school self and choose "Best Scarer" or "Most Likely to Break the Scaring Record" and be sure to keep "Cutest" and "Wittiest" in there too. MU Pennant - It's all about MU so be sure to hang a few pennants around to show your school spirit. MU Pins - First of all they're just cute. But, you can give them away as a prize for the winner of the Scare Games or Monsters Trivia. MU T-shirt - Ask your guest to wear MU attire like this t-shirt or if they are adventurous enough their favorite MU character. MU Acceptance Letter Invitation - I posted this acceptance letter invitation a few weeks ago. Here's your perfect time to put it to good use. Scare Theory Book - You can make your own Scare Theory Book like I did or you can make scary book covers. Use the books to vary the height of foods on the table or on book shelves to look like the MU library. Monster Canvas - Julie Gdowski posted these in a Facebook Silhouette group I am a member of, and has allowed me to share these cute Monster Canvases with you. They would be perfect for a "Monsters Wall of Fame" as a food table backdrop or a hallway. MU Tumbler - I have been meaning to make some MU sorority and fraternity beer mugs and wine glasses. I promise I will get to it. But you can always use these cute MU tumblers for the party. MU Greek Life - Sororities and Fraternitites play a big role in the movie, so why not divide your guests into them for your own Scare Games, trivia or scavenger hunt? To keep things fair have guests pull their Greek group out of a hat. Digital Download - Here are some really cute digital papers and embellishments to create your food labels, trivia sheets or scrapbook pages to remember the party. A113 - A number used over and over again in Pixar world, be sure to add it to the front door and see who gets the reference. Thanks to my friend Deb from Focused on the Magic for inspiring this idea. Sulley Coaster - Great to keep water rings off of the furniture, a fun party favor for your guests and fun little extras to take your party over the top. MU Student ID - You can add the Student ID's in with the invitation or have them set up on a table for guest as they arrive but everyone needs a student ID. They can even be used as a placecard at the table. Another fun and inexpensive party favor for your guests - and a great addition to a scrapbook page. Mike Coaster - Mike & Sulley are a team so if you have Sulley coasters you gotta have Mike, right? 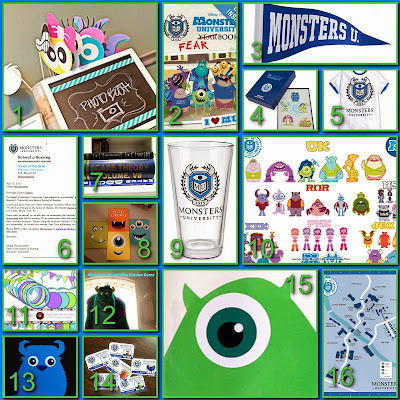 What's your favorite from the Monsters University Party Board? Are you planning a MU inspired celebration this year? I would love see pictures!! 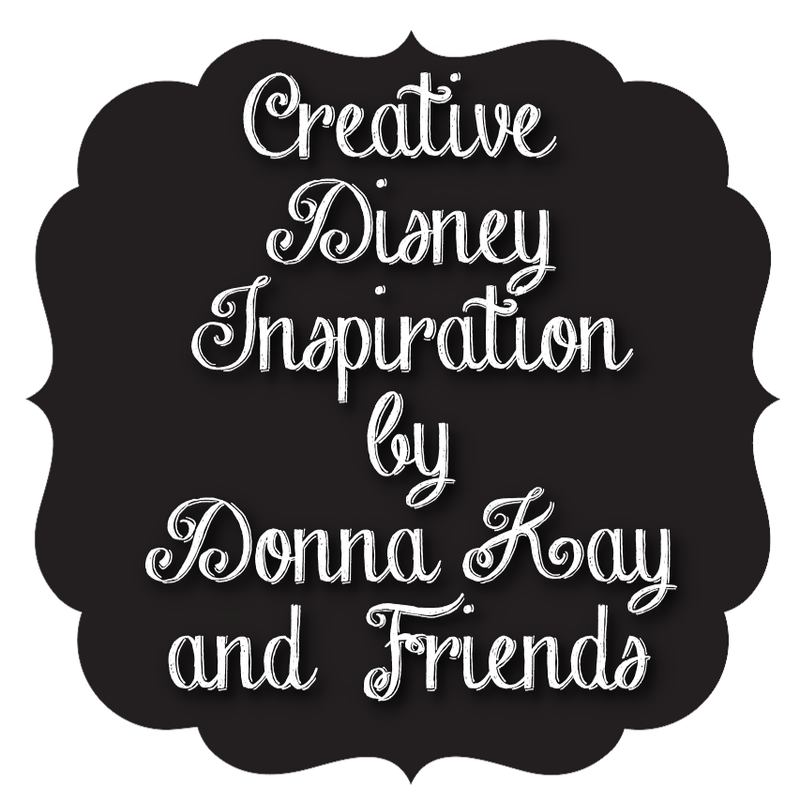 You can share your thoughts, ideas and pictures on the Disney Donna Kay Facebook page. You come up with the neatest ideas! I hope that one day I get to come to a party at your house! This Monsters University one looks like so much fun! If you're ever coming to south Alabama let me know and I will plan one just for you!! That looks like it would be a fun party. I love the map and treasure hunt idea! How fun. I love the Monsters University map and the idea for a scavenger hunt. You really could let your imagination run wild there. Mary, I would love to actually throw this party for my Disney friends. I think we could have so much fun, too bad we all live so far away from each other. From the photo booth to the "acceptance letter", you really have thought of everything Donna. A+ for your party boards!! Thanks :D!! I love doing them so much. Maybe one day we can have a Magical Blogorail reunion and I can actually throw on for all of us. How would you guys feel about traveling to south Alabama?? Thanks Mindy! I think you should do it just for the fun of it!! If you do I would love to see pics! !